The Premier Mounts MM-BE152 Dual Monitor Curved Bows on 15" Pole with Extrusion Base is an ideal solution for mounting up to 2 (10 to 24”) screens on to a single display unit without sacrificing valuable desktop space. The unit features a curved mounting bow on a 15” pole. The bow has 2 standard VESA (75 x 75, 100 x 100mm) mounting heads for attaching the monitors. Moreover, the position of the curved mounting bow can be adjusted along the length of the pole and fixed with the set screws. 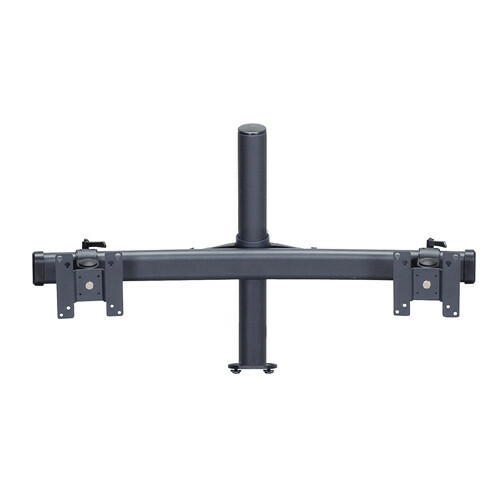 The mounting heads offer 90º omnidirectional movement and 360° rotation, so you can adjust the orientation of the monitors to set the optimum viewing angle. In addition, you can adjust the position of the mounting heads laterally. The extrusion base of the 15” (38.1 cm) pole is designed for extrusion tracks or rails typically used in monitoring consoles. It fits on to standard tracks and is a great mounting option for upgrading consoles with traditional monitors to flat-panel consoles. Furthermore, the integrated cable management system organizes and protects the monitor cables and also gives a clean finish to the installation.